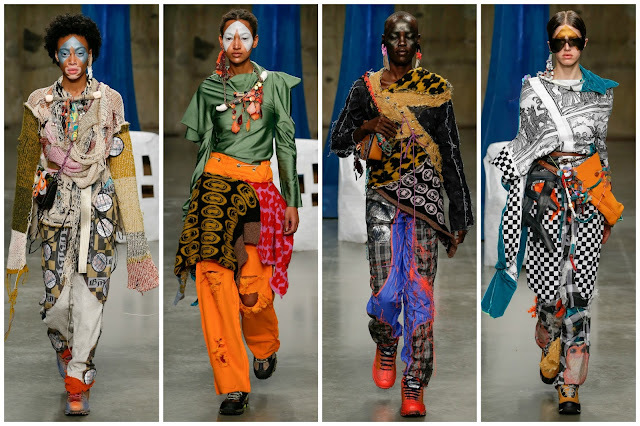 Lulu Kennedy’s Fashion East incubator programme for emerging designers has launched many careers. Notable names include Simone Rocha, Jonathan Saunders, Gareth Pugh and Roksanda Ilincic, all prolific London success stories. In recent years there hasn’t been a designer that has reached the same heights as any of those designers but that is partly due to the overcrowded industry, the sheer amount of designers on display. Kennedy selected four designers to present at the Topshop Show Space at the Tate Modern on the second day of London Fashion Week. 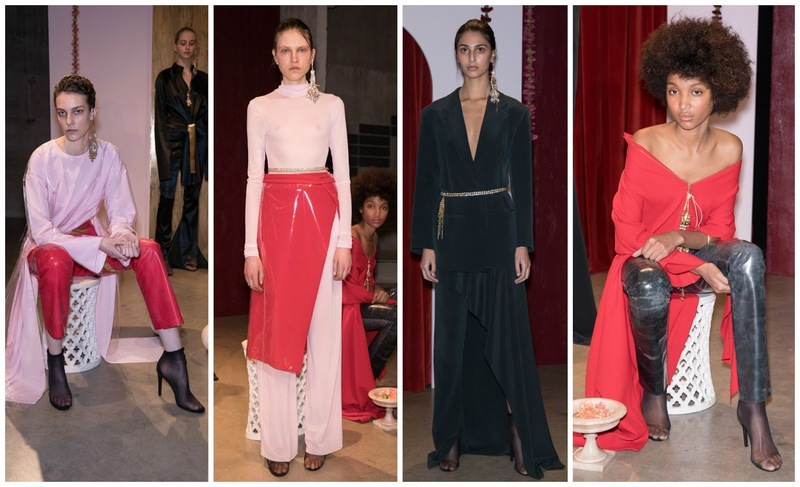 Kickstarting proceedings was newcomer Supriya Lee, a British-Indian designer who graduated from the Edinburgh College of Art before completing a Womenswear MA from the Royal College of Art. Annexing the main show space was Supriya’s set, constructed by production design company Studio Maud. She wanted to decode the duality between her British and Indian heritage, beginning with an image of her grandmother wearing a sari. The defining feature of a sari is the flattering drapery; the breadth of fabric and the way it wraps around the female body was particularly influential. There was a bubblegum pink top, draped across the body and falling into a sweeping train and a black skirt with a cascading drape (infused with masculinity at the sight of the blazer it was styled with). She used Indian costume jewellery to accessorise the ensembles but also as devices on the garments such as a zip on a satin jumpsuit. The rich, decorative nature complemented the edgy, city-slicking vibe that underpinned the collection. Faux-leather marble-effect trousers were styled with an off-the-shoulder scarlet top with a flowing train—a glamorous fusion of Britain in the 80s and the richness of Indian dress. What’s most exciting about looks that incorporated British-Indian cultural heritage was how simply they could transpose to the modern woman’s closet. It may be her debut show but Supriya took my breath away. In comparison to her counterparts she evidenced the most potential and possibility for longterm growth and sustainability in her business. Her autobiographical exploration of identity, secondly, cements her as a force to be reckoned with; identity, now more than ever, is an important topic that has to be addressed. With more conviction there will be a burgeoning success story on the horizon. Consistency reins supreme with Mimi Wade. One ascribes the cartoonish saccharinity of her Old Hollywood-preoccupied designs to her grandmother, Pamela Curran, a B-movie actress from the 1950s. She isn’t trend led and serves a customer unbeknownst to many of us: she is attuned to popular culture, is bubbly and effervescent in nature, and is probably spearheading the reclamation of the colour pink for adult women. Unsurprisingly, Mimi’s girls were pretty in pink this season with the inspiration being The Pink Panther, the 1963 film following the inept Inspector Jacques Clouseau about the theft of a diamond. A magnifying glass with pink paw prints, paw prints trailing a Victorian-inspired mini dress hemmed with white lace, a torched Pink Panther poster—there is no questioning Mimi’s affinity for literal referencing. It was amusing, to say the least. However, there were parts of the collection that signalled an imbalance. There were other references to Old Hollywood included a nod to Alfred Hitchcock. “Dial ‘M’ for Mimi!’ was scribed on one skirt. Cupid, too, appeared; the cherub was pictured in a scallop-edged love hearts with a drawn bow. There were miscellaneous animals. The incoherency between the initial Pink Panther idea and the slew of other cartoon characters was unappealing. An interesting aspect to this show was the format: the catwalk presentation, at last. I bemoaned last season that Mimi’s girls deserved a runway show over a static presentation. I believe the show space may have been too big for her designs and they were lost in the cavernous enclaves, but a more intimate salon presentation, with a set, might have much more character. Every label should have character but not every label will let it be a defining feature. A Sai Ta, another Fashion East newcomer, structured his press release like a Chinese takeaway menu. 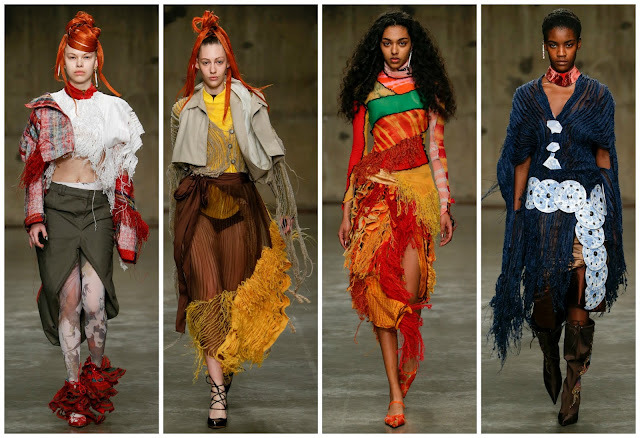 The Central Saint Martins graduate, with experience including time at Yeezy, is representative of ebullient, New Wave Maximalism that emerged in the wake of the stealth wealth years. His crochets, needle punched, bleached and deconstruction contribute to this cleverly diverse woman. “The gift of chaos is the Asai woman,” according to the show notes. In the same breath as Supriya Lele, Asai’s multicultural heritage inspiring his collections bears the utmost relevance and importance. Challenging Western stereotypes is a long overdue call to action for westerners to educate themselves on the actualities of China rather than being bound to outdated, idiotic notions crafted by racist white people. The fashion industry needs people like Supriya and A Sai to keep us all in check. Fashion is an expression of self through clothing; the medium has the power to change or, at least, challenge perceptions. People often forget about the power of the fashion industry. It’s young designers like A Sai who are using their platforms responsibly to promote a positive message. His clothes may not be to your liking, but I wouldn’t see how his messaging couldn’t appeal to you. Matty Bovan, returning to the roster, also had a message about the world and the direction we’re heading. His glamorisation of the post-apocalyptic doom and gloom seems plausible in 2017, when two years ago we would’ve laughed. He was looking at films like Alien, Alien 2, and Blade Runner. Speaking to Love magazine he said, “all of the bad guys in those films are the big corporations. And they’re like this big monster: that’s the biggest evil, that’s the alien.” If that isn’t a characteristically defiant London message from an upcoming designer then I don’t know what is. Matty has a valid point: corporations are polluting the world, in a variety of ways. 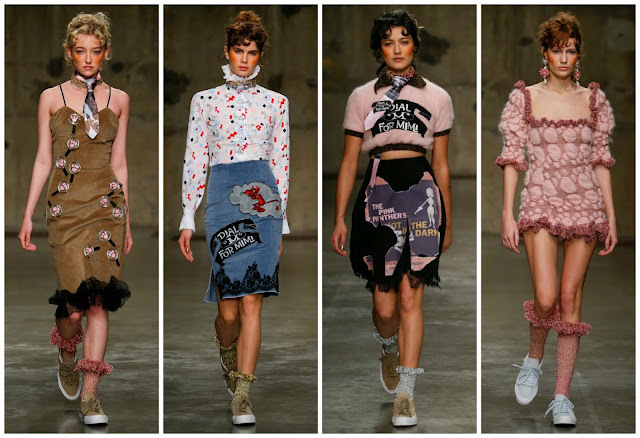 Big corporations are the reasons for brand closures in London, from the seminal Meadham Kirchhoff or the fabulous but forgotten Louise Gray. Based in his family home in Yorkshire, Matty is a designer who last season I feared could go down the same road as Meadham Kirchhoff—he’s a designer with the support of super-stylist Katie Grand, has credentials that included stints at Marc Jacobs and Louis Vuitton, the press are behind him wholly, but I couldn’t see anything that was truly saleable and women would want to own. This season he worked on outerwear in an effort to expand on his design language, build a collection of garments that would sell. There were some lovely crochets, some bold deconstructed hoodies and skirts; the Matty Bovan girl was the product of the apocalypse. If we truly are heading towards the apocalypse, at least we know there will be remarkable youngsters making their mark on the world. It is their fervour and resilience that will keep us going.